The busiest young manufacturer in disc golf just got busier. After a week-long social media campaign sprinkled with teaser photos and vague hints, MVP Disc Sports on Friday announced the formation of a new, separate brand called Axiom Discs. Billed as “the new style of science,” Axiom Discs will still contain MVP’s signature overmold technology and be produced and distributed by the Michigan-based company. So how does this new venture differ from the typical MVP output? Axiom Discs will feature a variety of overmold and core color combinations, as well as new molds that differ in flight and profile from MVP’s existing lineup. While the new color combinations are a nod to the first discs the company created, MVP Disc Sports co-founder Brad Richardson said the inspiration for creating this offshoot came from the company’s line of glow plastic. All sorts of things are happening in the disc golf world. Sorry for the late weekly news wrap on this but shoddy internet hookups while away this past weekend made for a tough time to get all the links together! Before getting to the weekly links, there’s some news to announce from Discraft. The company is announcing Monday a new plastic — and, according to Discraft, the new name in premium plastic is Titanium. The plastic is very durable and grippable. On top of that, Discraft says Ti is nothing disc golfers have seen before. Starting with an enhanced engineered base polymer for superior performance, Discraft says it then combines it with special additives to boost the appearance to a new level. On top of it all — there’s a three-dimensional World Champion signature stamp on each model. The signature, instead of being embedded into the disc, is slightly raised from the surface, which, according to the company, provides and additional grip assists those players who want a more tactile throwing experience. 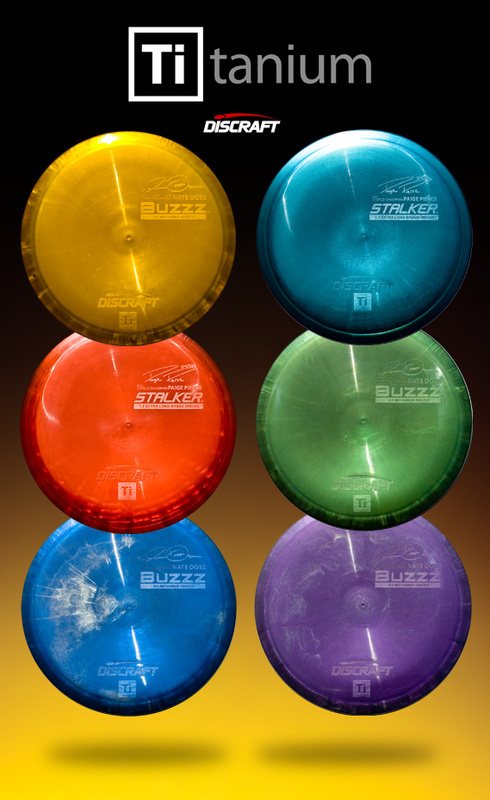 The initial releases are the Buzzz, a mid-range driver with the signature of three-time World Champion Nate Doss. The second is the Stalker, an extra long range driver, with the signature of 2011 World Champion Paige Pierce. Doss will, in the future, also have signature discs of the Ti Force and Nuke. Discraft also noted that 2010 World Champion Eric McCabe will eventually endorse a Ti disc as well. The rest of the weekly wraps of links is below!